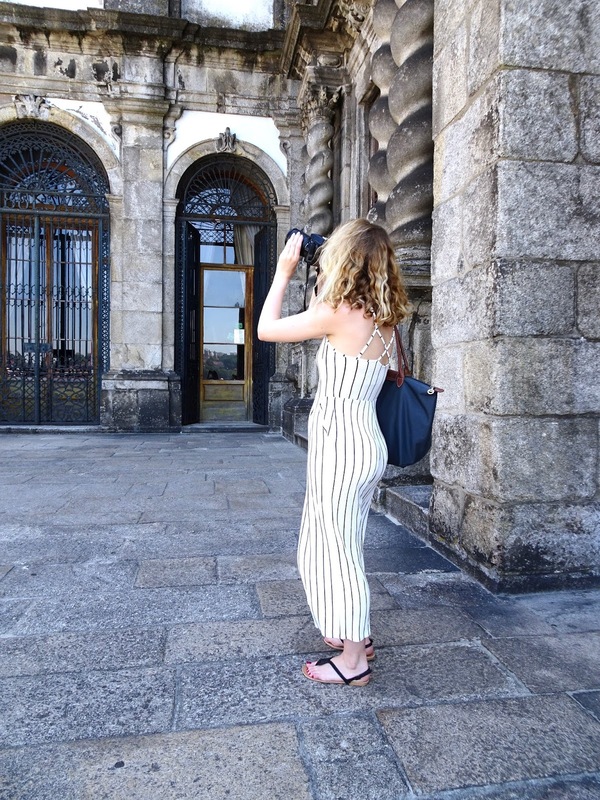 When I was planning what kind of blog content I wanted to capture whilst I was in Lisbon, an outfit diary was one of the first things that made the list. 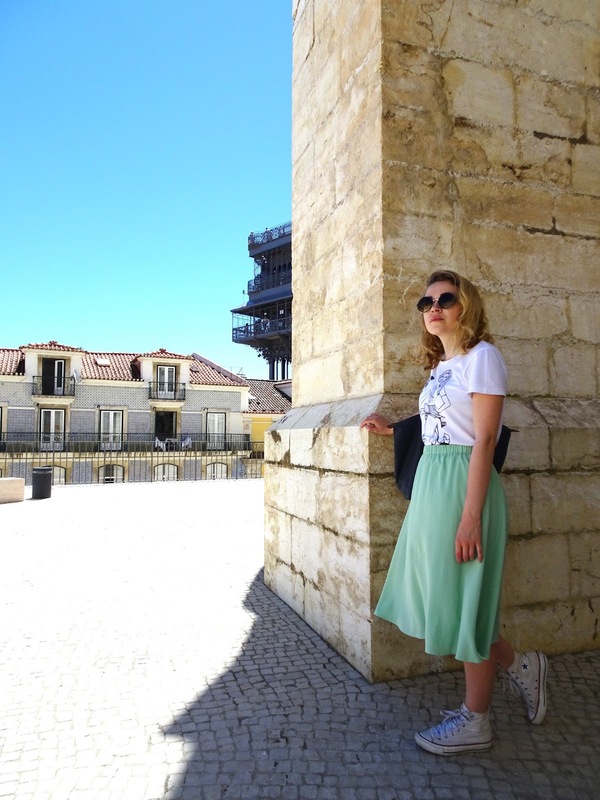 As I mentioned in my High Street Style Haul, I’m always keen to keep up the fashion part of my blog and I love reading outfit diary posts, or watching lookbook videos from people’s travels. 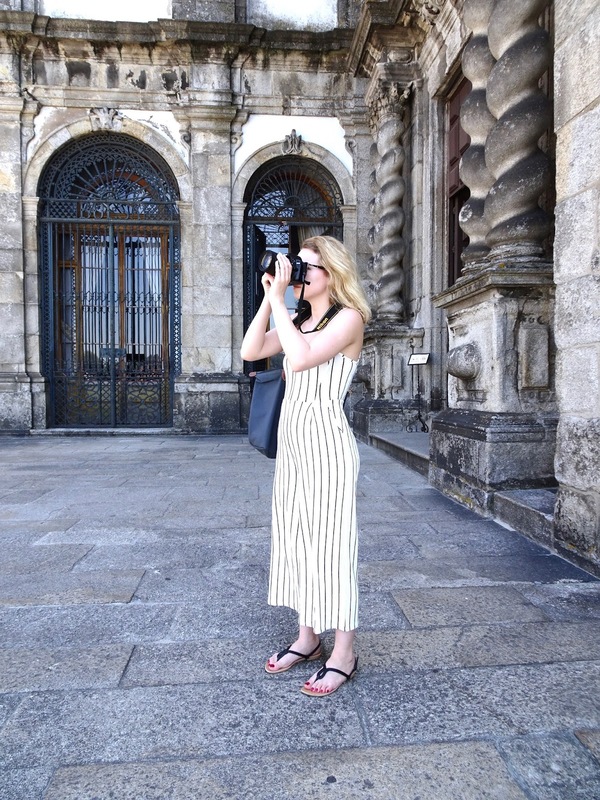 I definitely make more of an effort with putting together outfits on holiday; when there are photos being taken at every opportunity, it’s always best to avoid throwing together mismatched combos that will leave you cringing for years to come. Although maybe that part’s inevitable. 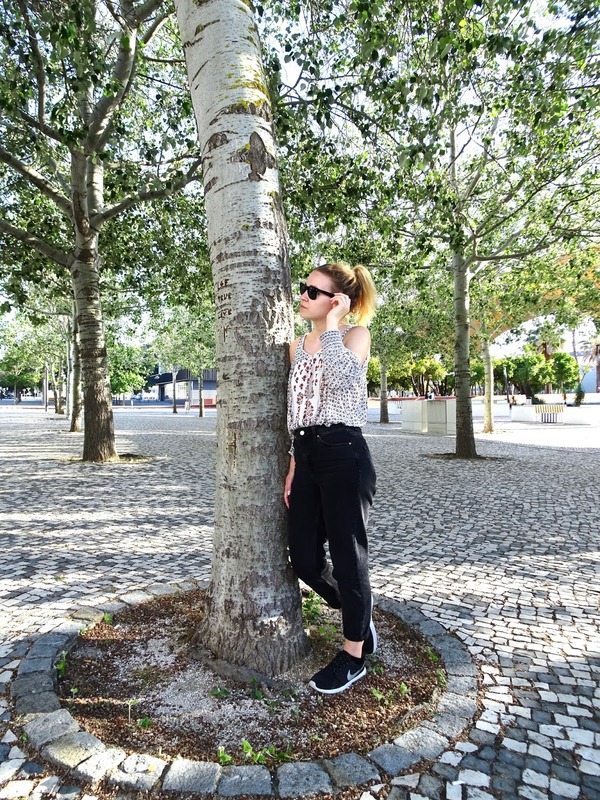 Who knows what 2026 Laura will think of the wide-legged culottes trend that we all think looks super cute right now. Picking an outfit for the travel day is always the hardest part, especially when you’re travelling from cold, wet London to somewhere a lot hotter. 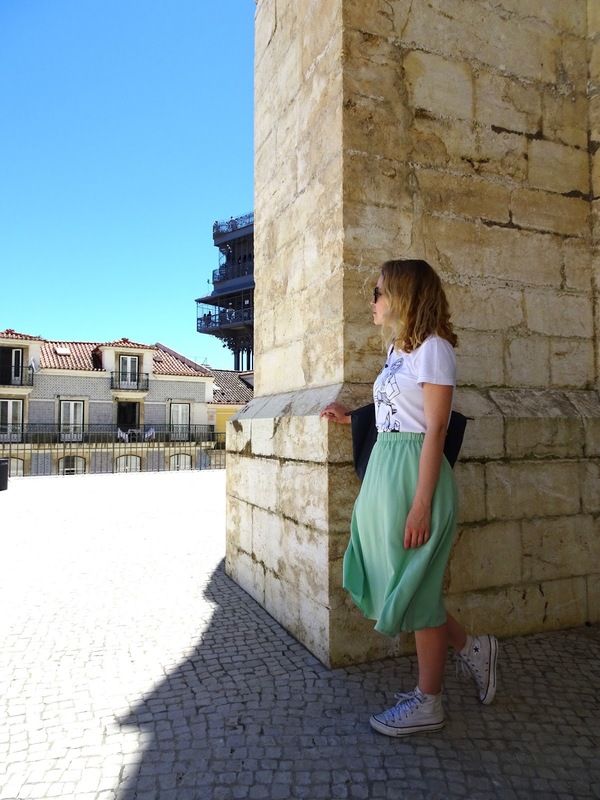 Obviously comfort is key, but I was faced with the dilemma of knowing I always get cold on planes and in airports, but also knowing that we would be walking around sunny Lisbon for a few hours before we could check into our accommodation. 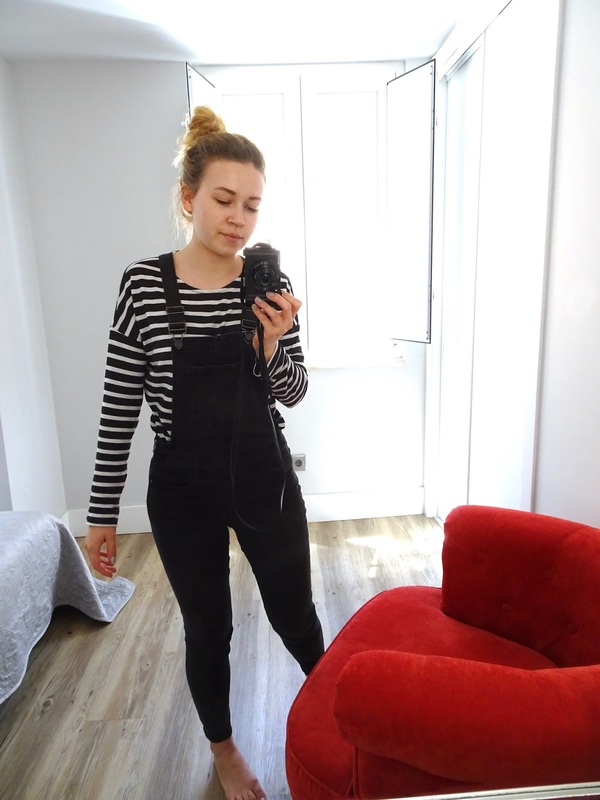 In the end I went for these New Look dungarees with a simple H&M t-shirt, which I then swapped for a Topshop Bardot cropped alternative once we arrived. 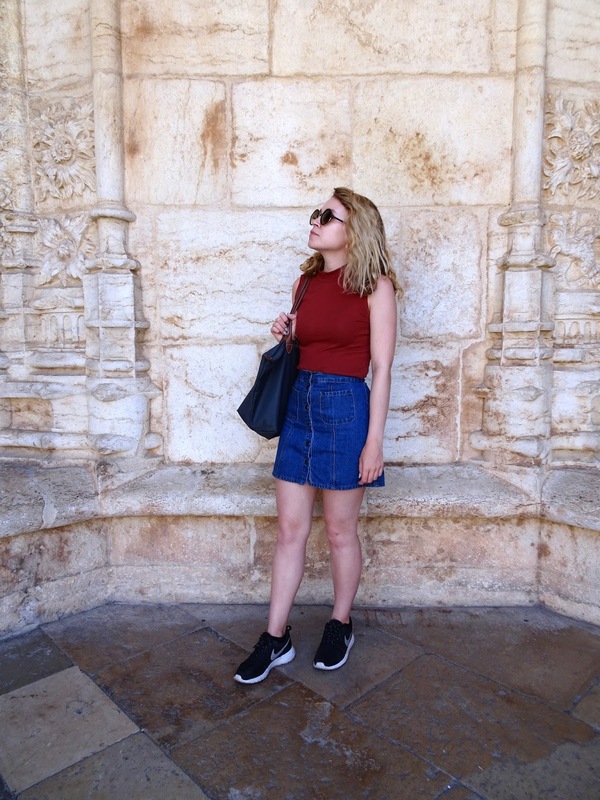 I also took my Longchamp bag as hand luggage and opted for Nike Roshes for comfort and my Quay sunglasses to complete the look. 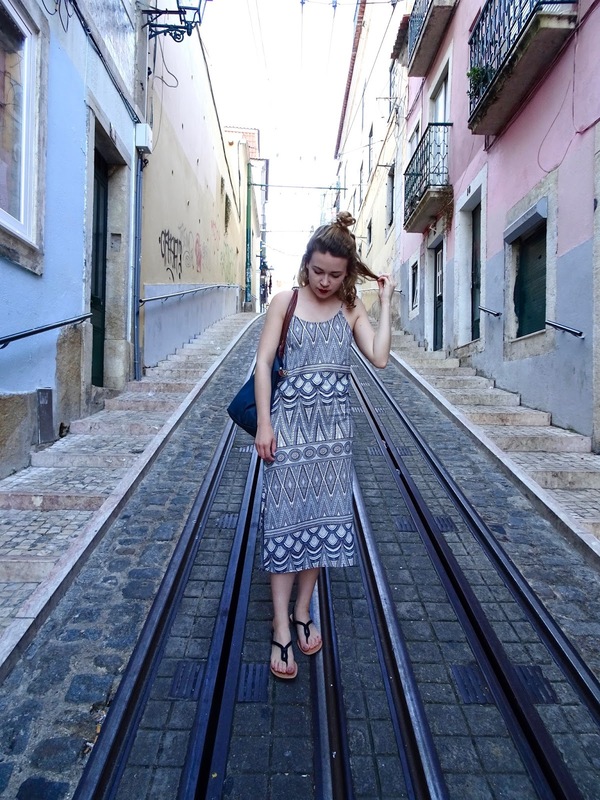 We spent our first full day wandering around Lisbon Old Town and the castle, and I quickly realised that the steep cobbled streets called for comfortable footwear. 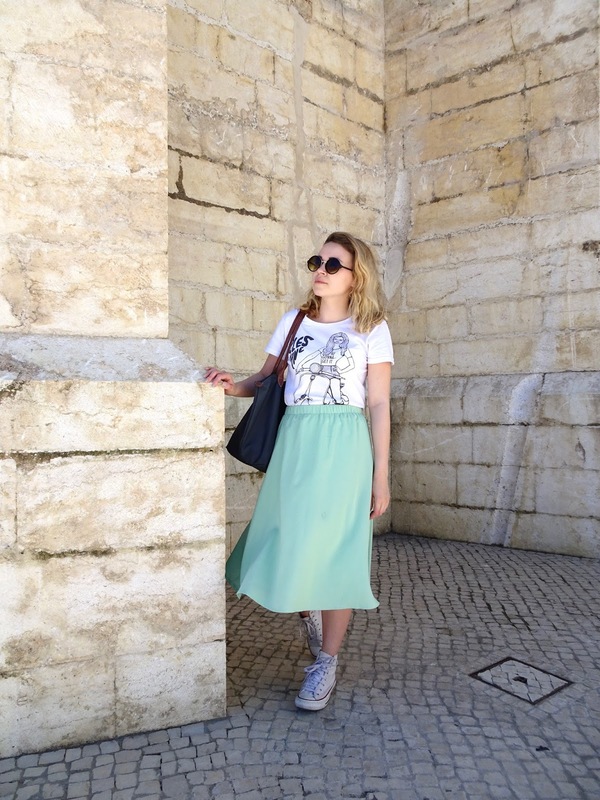 This Missguided midi skirt was perfect for the heat, and also meant one less day of slathering my very pale legs in sun cream. I love pairing it with a white slogan t-shirt, keeping it casual for a day of walking around the city. I also went for these round sunglasses, which are probably my favourite bargain of all time at just £2.50 from a vintage shop. Yep, £2.50. We headed out for tapas in the evening, which obviously called for an outfit change, so it was time for this H&M dress to have its first outing. Since it was just a short walk up the tramline, I ditched the converse for simple New Look sandals. Sinta was a town about a thirty-minute train ride away, and as we were going to be out in the sun all day, I wanted to shade both my head and my shoulders. 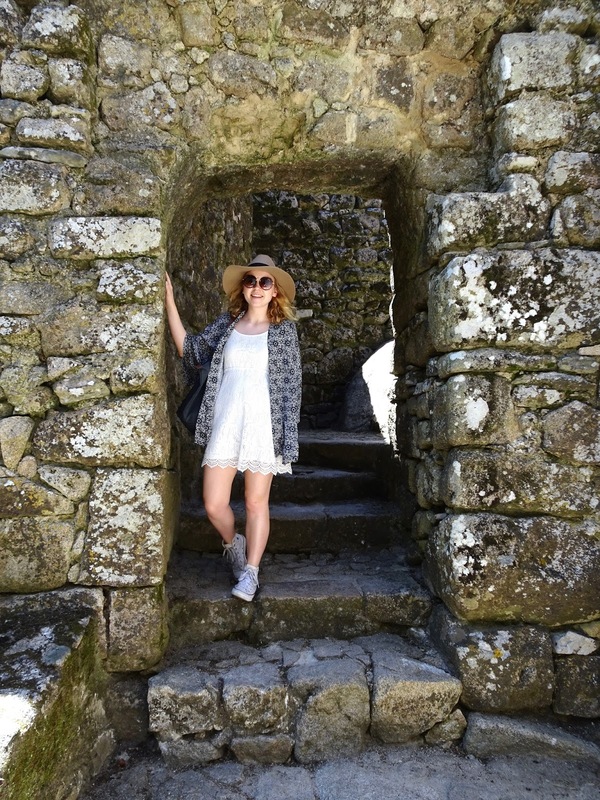 I have recently been loving adding my ASOS kimono to this H&M lace dress, and the hat added that extra something. Or it just made me look like a confused country singer, I haven’t quite worked it out. 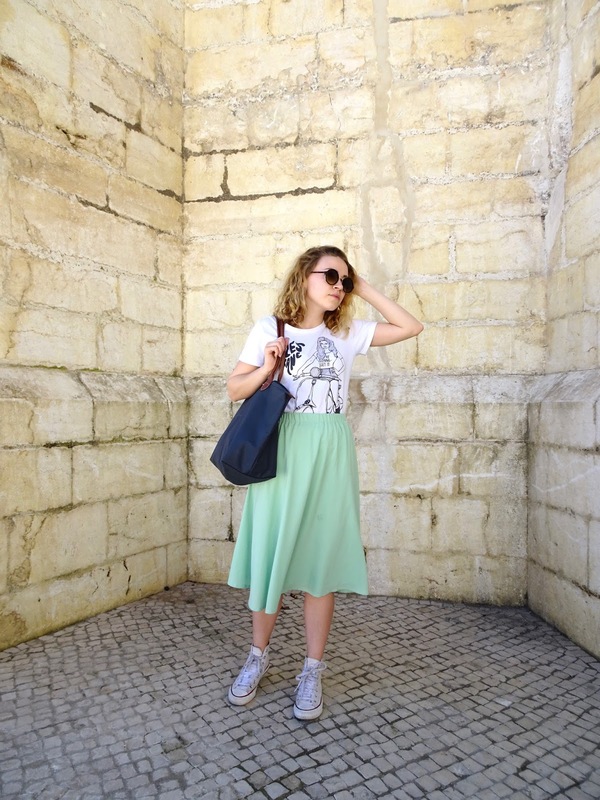 As we were flying to Porto for the day, again I needed something comfortable but also cool enough to walk around in the 30-degree heat. 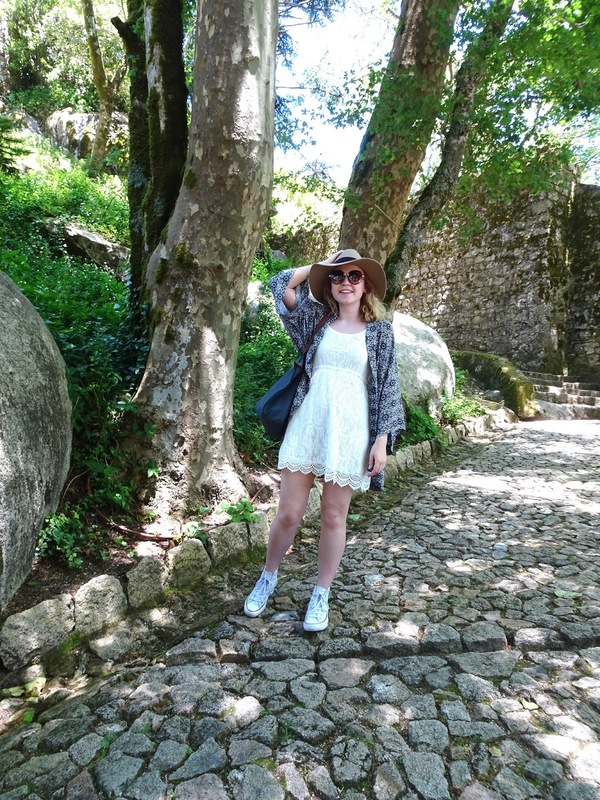 My ‘trusty’ Converse had started to betray me in Sintra by rubbing my toes, so I braved wearing sandals all day, which could have been a complete disaster. Thankfully my feet survived the ordeal. Just about. Following a very delayed and late flight back to Lisbon, we spent most of the next day recovering in our apartment, before taking a late afternoon trip to the Aquarium. I went for my black Topshop Mom jeans in anticipation of air con with this cut-out top from Urban Outfitters, but what I didn’t anticipate was the rather sticky metro ride there. It was back to trainers again for this adventure, and time for another pair of sunglasses, this time my classic Ray-Bans. Don’t listen to anyone who says taking five pairs of sunglasses on a seven-day trip is excessive. No one needs that kind of negativity in their life. 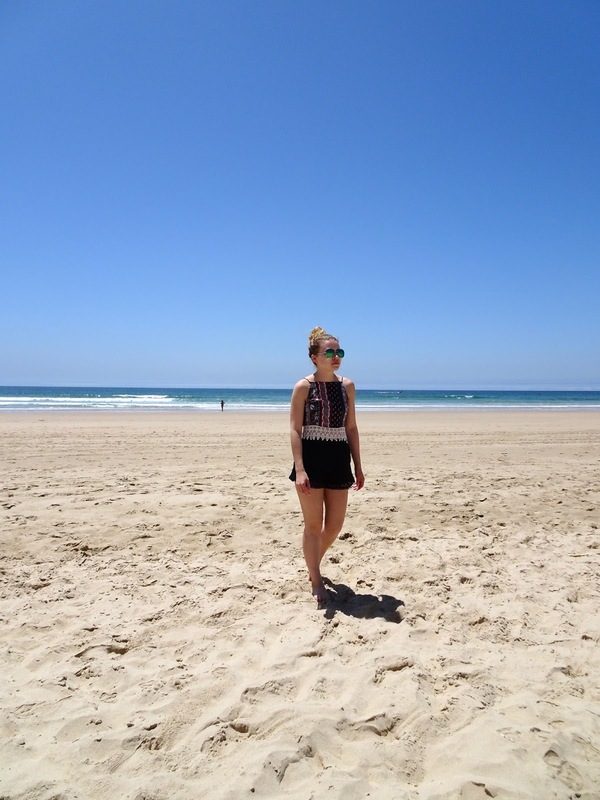 This was the best we could do for a beach #ootd, seeing as I was covered in sun cream and sand, and this was the sixth day in a row I’d made Tom stand in the sweltering heat taking countless outfit photos for me, 97% of which we all knew I would immediately delete (thanks pal). I found this top on a complete whim in the sale section of Abercrombie & Fitch in Singapore of all places, and it’s the perfect beach top to throw on over a bikini because it ties up at the back. 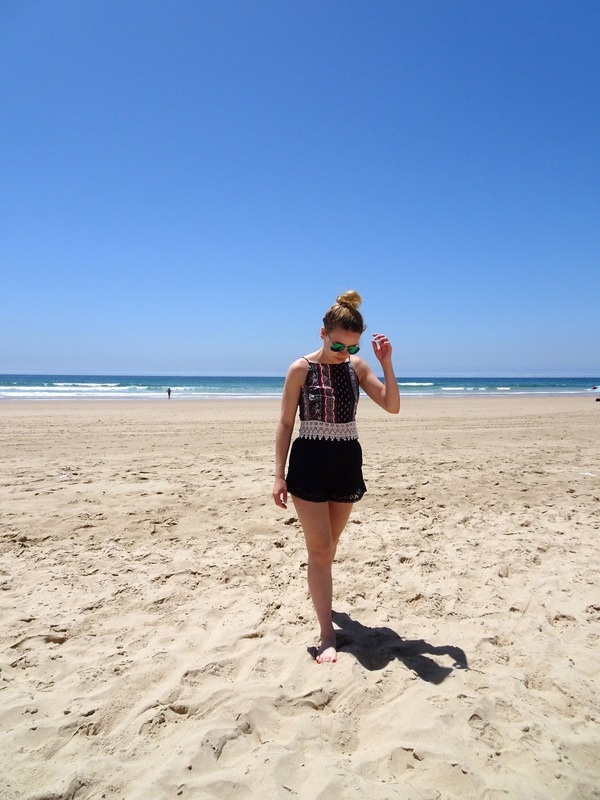 The lace detail shorts are another H&M classic, which I always pull out for beach days and festivals. 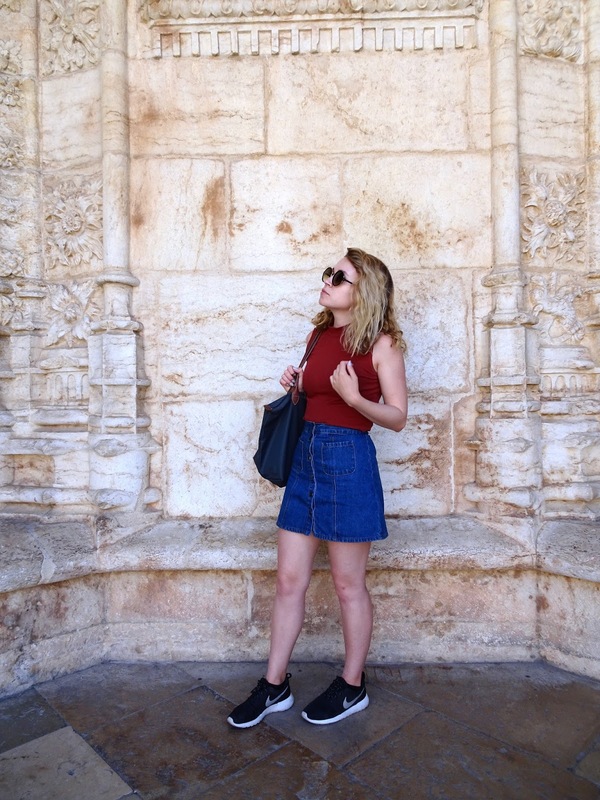 On our final day we crammed in what was left of Lisbon and it was back to the only footwear option that hadn’t damaged my feet. 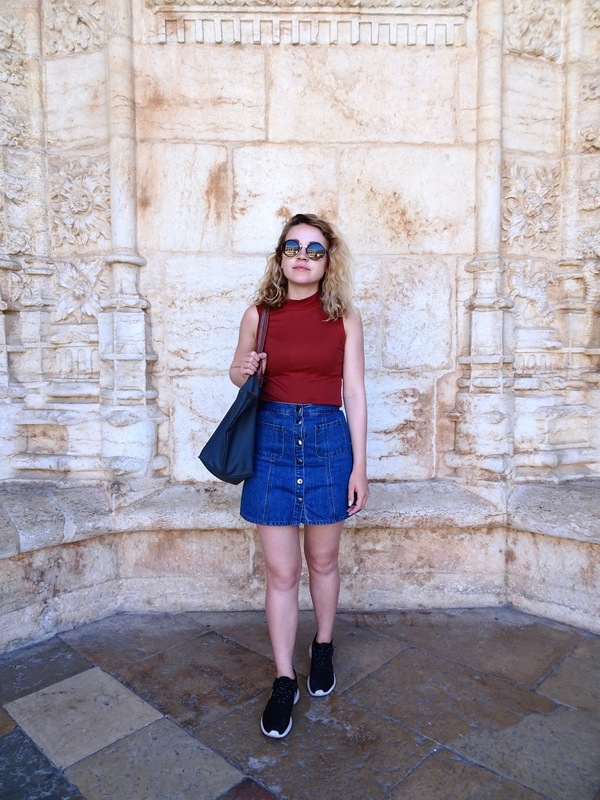 This Urban Outfitters denim skirt has become a complete wardrobe staple for me, whether it’s with tights and a jumper in colder weather or with a basic sleeveless top and sunnies. 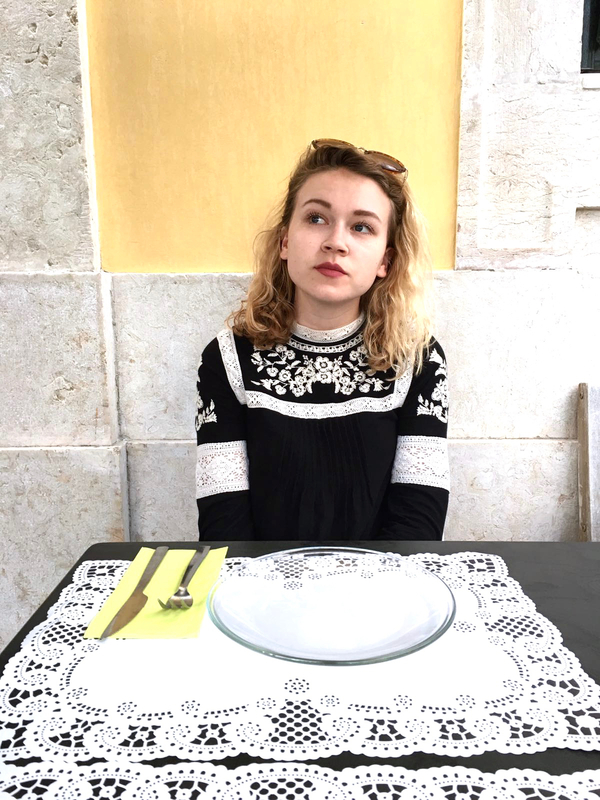 It was a little cooler in the evening when we went out for tapas (again), so I changed into this black embroidered Topshop smock dress. I love the detailing and the fit of this dress – it’s another item that works so well in all kinds of weather. *Affiliate links may have been used in this post. LOVE LOVE LOVE. 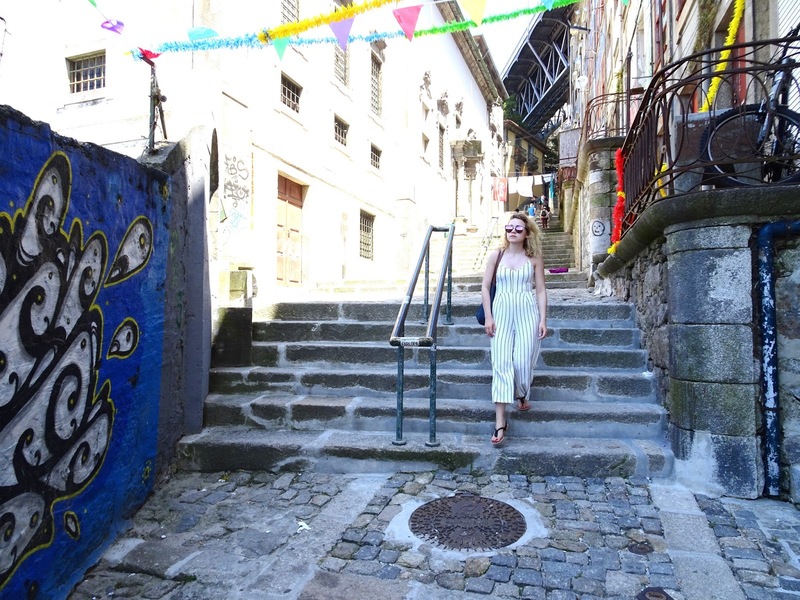 Amazing photos, gorge outfits and beaut backdrops. 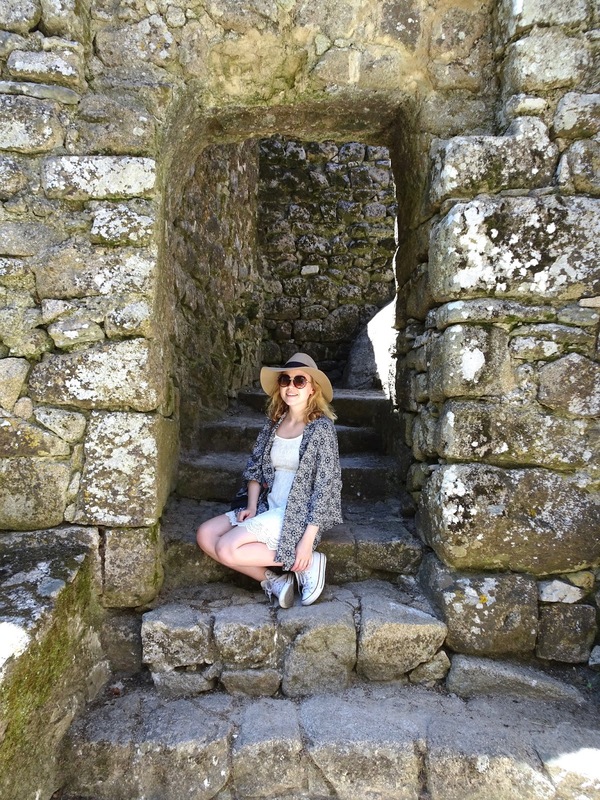 Sounds like an amazing hol and you looked fab!